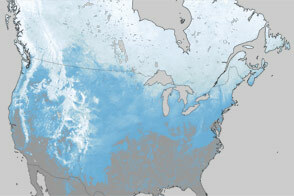 In mid-December, the weather in eastern North America cooperated with the calendar, and a wintry blast from the Arctic delivered freezing cold air, blustery winds, and snow just in time for the Winter Solstice on December 21—the Northern Hemisphere’s longest night of the year and the official start of winter. 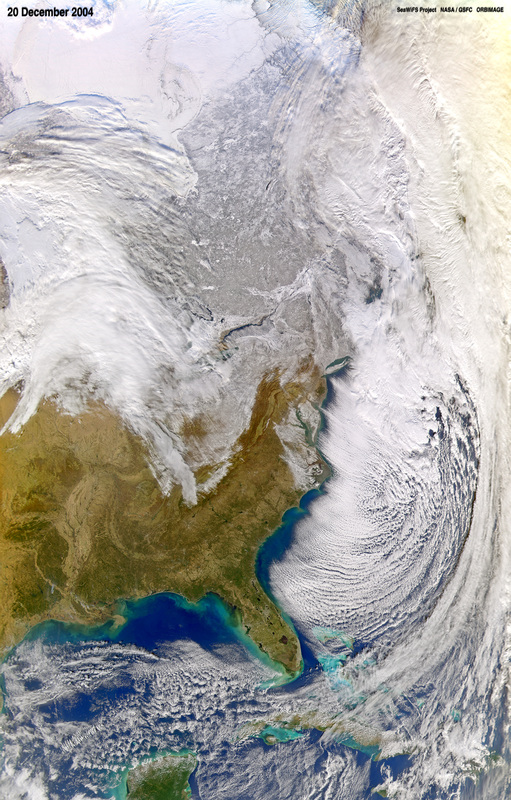 This image was captured by the Sea-viewing Wide Field-of-view Sensor (SeaWiFS) on December 20, 2004, the day after an Arctic storm dove down into the United States, bringing snow to New England (upper right of top image); the coastal mid-Atlantic, including Washington, D.C.; and the southern Appalachian Mountains in Tennessee and North Carolina. Over the Atlantic Ocean (image right), the fierce Arctic winds were raking the clouds into rows, like a gardener getting ready to plant the seeds of winter. 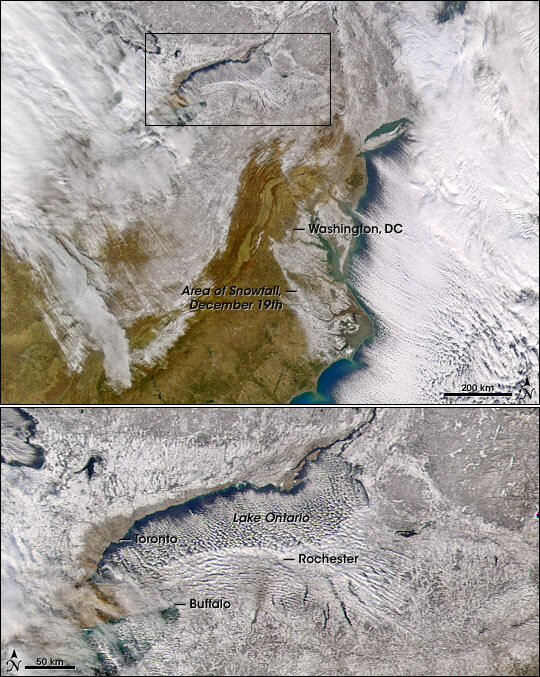 The detailed close-up at the bottom of this image pair shows the cloud and snow patterns around Lake Ontario, illustrating the occurrence of “lake-effect snow.” Areas in western upstate New York often get as much as fifteen feet or more of snow each year as cold air from Canada and the Arctic sweeps down over the relatively warm waters of Lakes Ontario and Erie. Cold air plus moisture from the lakes equals heavy snow. 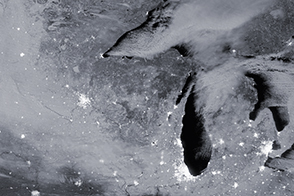 Since the wind generally blows from west to east, it is the “downwind” cities like Buffalo and Rochester that receive the heaping helpings of snowfall, while cities on the upwind side of the lake, such as Toronto, receive much less. Unlike storms that begin with specific low-pressure systems in the Pacific Ocean and march eastward across the Pacific Northwest, the Rockies, the Great Plains, and sometimes the East, the lake-effect snows aren’t tied to a specific atmospheric disturbance. They are more a function of geography, which means that the lakes can keep fueling snow storms for as long as they remain ice-free in early winter, as well as when they begin to thaw in late winter and early spring.